Correction: The 1-1 Air Defense Artillery Battalion was previously misidentified as the 11th ADA Brigade. 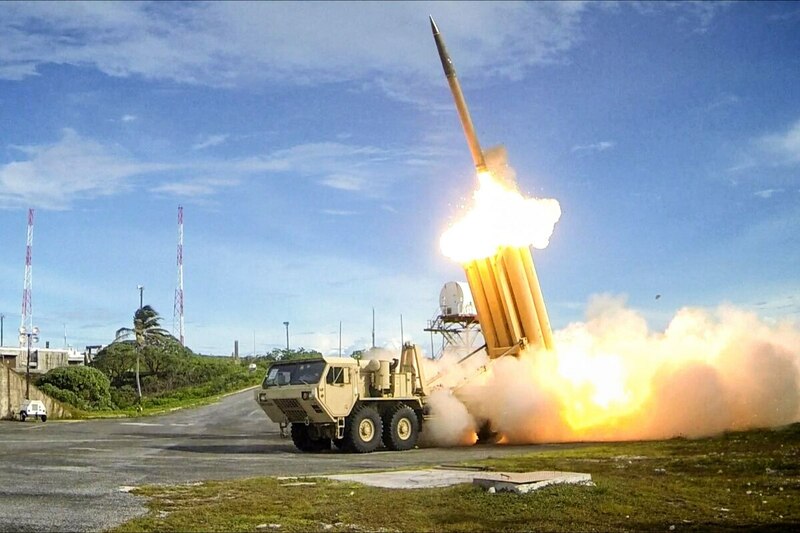 WASHINGTON — After a recent trip to the Asia Pacific region, the commander of Army Space and Missile Defense Command said he is confident the service is postured well, both in the region and in the homeland, to defend against any possible missile attack from North Korea. Lt. Gen. James Dickinson, who oversees the global posture of Army missile defense-related units and who has spent several years serving in Korea and Japan in previous roles, said, “the theater has changed significantly” since his time there before, but what the Army has supplied in the region to aid allies and defend U.S. troops there is robust. A second AN/TYP-2 radar has been deployed to Japan as well as a Terminal High Altitude Area Defense system — or THAAD — to Guam and South Korea. When Dickinson last served in the region there was just one AN/TPY-2 radar in Japan. And Dickinson added he is “fully confident” in the Ground-Based Midcourse Defense System located in Alaska and California, particularly following a major successful test in May. The system is manned by Army National Guardsmen. The general visited Guam, Japan and South Korea on his trip and saw key elements of the layered regional defense that the Army brings to the table in the region. Starting his trip in Guam, Dickinson spent time with the soldiers manning the THAAD battery that has been deployed there for several years to provide missile defense against a possible North Korean attack. North Korea has ramped up its missile testing exponentially since Kim Jong Un assumed power in the country and the testing becomes only more frequent with each passing month. Over the summer, North Korea tested an intercontinental ballistic missile which analysts say displayed, for the first time, capability to exceed 10,000 km in range, a distance that could reach San Diego but also New York. And North Korea’s rhetoric is also growing more bellicose, particularly when it threatened to nuke Guam in August. Dickinson found THAAD operators — who are forward stationed in Guam — deeply engaged in the community and the weapon system in a high state of readiness. THAAD’s track record in tests is now 15 for 15 after taking out an intermediate ballistic missile threat-representative target in July. The general then traveled to Japan, stopping in Yokota where U.S. Forces - Japan is located and making a trip to Nasawa where an Army Joint Tactical Ground Station (JTAG) element is positioned, which provides missile warning capability and processes satellite data. He also visited the 1-1 Air Defense Artillery Battalion, a Patriot air-and-missile defense unit stationed in Okinawa. Japan has been busy demonstrating its own Patriot systems as North Korean missiles have been flying over parts of the country in recent months. 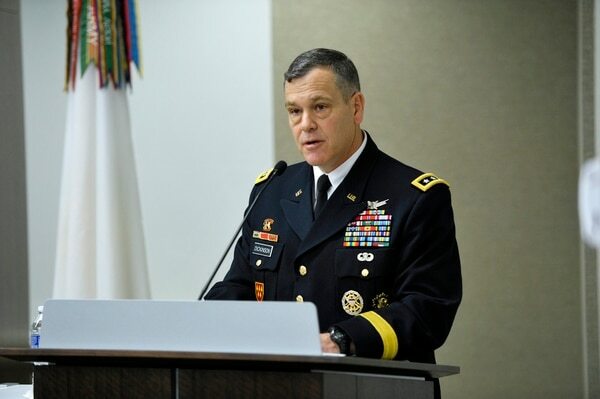 The final stop on the Asia Pacific tour was South Korea where Dickinson said he had the opportunity to visit the newly operationalized THAAD battery. The battery was originally scheduled to be operational by the end of the year, but as North Korea’s missile testing and aggressive rhetoric has increased, South Korea pushed to more rapidly set up six truck-mounted launchers capable of firing 48 interceptors, despite some push-back from China, which is concerned the THAAD system in South Korea isn’t just for defensive purposes against North Korea. He added the unit was able to “seamlessly” conduct the modernization effort while maintaining its warfighting capability. It was crucial the unit be upgraded as part of a layered missile defense against North Korea “given the current situation,” Dickinson said. Particularly leaders talked about space-based capabilities and the soldiers that the Army provides to do satellite communications management, which combats the “tyranny of distance” the region must cope with — having to communicate over vast areas, achievable through satellite communications.